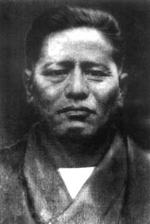 Chojun Miyagi was born on 25th April 1888 in Okinawa. At the age of five he became the heir to the Miyagi family. His training in karate began at the age of eleven under Ryuko Aragaki Sensei who practiced and taught Tomari-Te. When he was fourteen his teacher introduced him to Higaonna Kanryo Sensei. Chojun Sensei trained with Kanryo Sensei from 1902 until October 1916, when Kanryo Sensei passed away. During this time he was one of the few people who could withstand the severe training given by Kanryo Sensei. After the death of his teacher, Chojun Sensei continued with his own development including trips to China and research into physiology. Chojun Sensei was instrumental in registering Karate at the Butokukai in Japan. He developed the Junbi-undo we practice today, and introduced the basic kata Gekisai Dai Ichi and Dai Ni. He also developed Tensho and a revised version of Sanchin. In addition to his personal training and development of Naha-te, Chojun Sensei spent a great deal of his time promoting the art. In 1921, he performed a demonstration of Naha-te in Okinawa for the visiting Prince Hirohito, Emperor of Japan, and in 1925 for Prince Chichibu. Chojun Sensei had already envisioned the development of Naha-te not only in Japan but also around the world. It became increasingly important to organize and unify Okinawan karate as a cultural treasure to be passed on to future generations. In 1926, Chojun Sensei established the Karate Research Club in Wakas-Cho. Four instructors, Chojun Sensei, Hanashiro, Motobu and Mabuni, taught alternately some preliminary exercises and supplemental exercises. Afterwards, Chojun Sensei gave talks to the students about mankind, daily life, and the samurai code of ethics in order to improve their moral development as well. In 1927, Jigoro Kano Sensei, founder of Judo, saw a demonstration of a kata by Chojun Sensei and was impressed by the advanced technique and sophistication of Naha-te. Kano Sensei´s influence allowed Chojun Sensei to perform Okinawan karate at leading Japanese Budo tournaments sponsored by the government. In 1930, Chojun Sensei performed at the Butoku-kai Tournament and then later at the Sainei Budo Tournament in 1932. As its exposure increased, many became interested in Chojun Sensei´s style of martial arts. One of his senior students, Jinan Shinzato Sensei, gave a performance of kata at a Japanese martial arts tournament. Afterwards, a master asked the name of his school. Shinzato Sensei had no answer for him, and upon his return to Okinawa he told Chojun Sensei about his encounter. In order to promote his art as well as cooperate with other schools of Japanese martial arts, Chojun Sensei decided it was necessary to name his martial art. It became known as Goju-Ryu Karate, meaning "hard and soft" taken from the precepts of traditional Chinese Kempo. He was the first among different schools of karate to name his art and in 1933 his art of Goju-Ryu was formally registered at the Butoku-kai, Japanese Martial Arts Association. Chojun Sensei travelled extensively, spreading Goju-Ryu to mainland Japan and as far afield as Hawaii after a local Hawaiian newspaper company invited him to introduce and promote karate in Hawaii in 1934. Two years later Chojun Sensei spent two months in Shanghai, China, for further study of Chinese martial arts. In 1937, he was awarded a commendation by the Butoku-kai for his kata. Chojun Sensei continued to develop Goju-Ryu by analyzing and employing scientific methods of exercise in his research. His work found many practical applications and it is no surprise to learn that many of his students were in the police force. At this point the Second World War interceded, and the aftermath led to a prolonged period of severe hardship in Okinawa. Not surprisingly, the few students who survived the conflict could no longer train. Of those that lost their lives during the war, was Chojun Sensei´s top student Shinzato Jin´an, who was to have succeeded him. As normal life returned again to Okinawa in the aftermath of the war, Chojun Sensei began teaching again in his garden dojo. Realising that he had so much knowledge to pass on, Chojun Sensei began grooming a new and promising young student called Anichi Miyagi (no relation) to succeed him. They trained on a one to one basis similar to the method he was trained by Kanryo Sensei. Sadly Chojun Sensei passed away on 8th October 1953. One hopes he appreciated that he had succeeded in sowing the seed that would not only preserve his life time´s work to Goju-Ryu karate, but see it expand into a global martial art.